Use Captcha : Defines if the application will have Captcha support. Number of Characters : Amount of characters in the Captcha image. Character List : List of characters used in the Captcha. Label : Message displayed for the Captcha. Error message : Captcha error message. Height : Height of the image generated by the Captcha ( in pixels ). Width : Width of the image generated by the Captcha ( in pixels ). Font Size: Size of the font used in the image generated by the Captcha (in pixels). Reload: Display the refresh button in the Captcha. 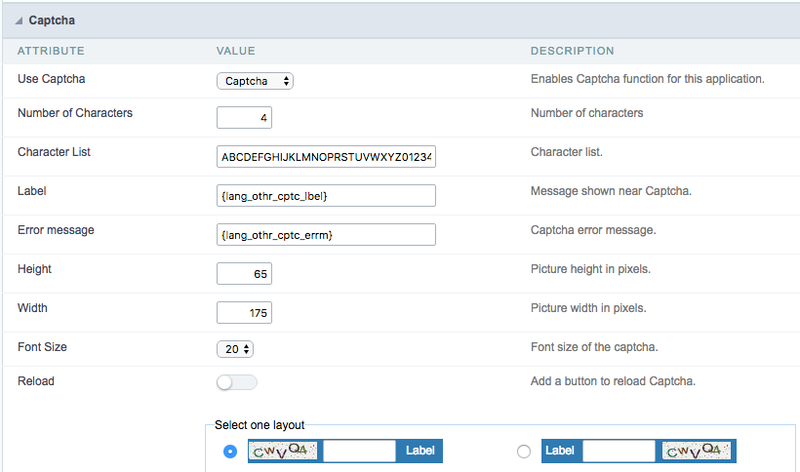 Select one layout: Offers various layouts (of positioning) for the Captcha display. 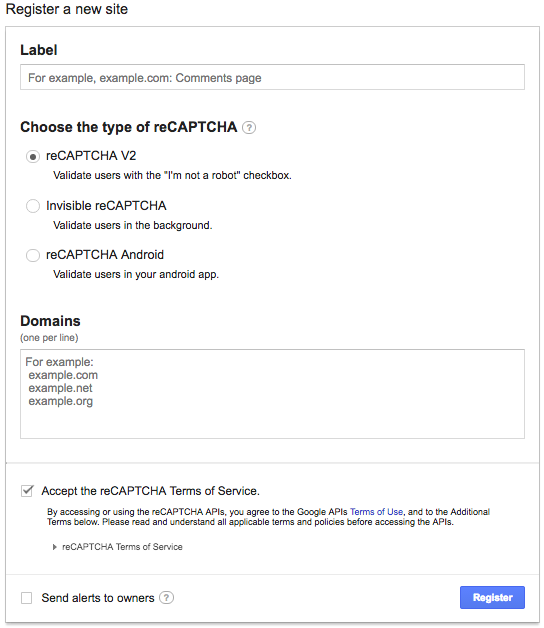 ReCAPTCHA is a tool used through the API provided by Google for sending forms adding security at the time of form confirmation (preventing automation for submission). 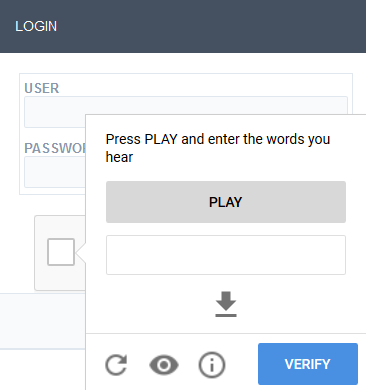 Label: Project name which will be created to contains the reCAPTCHA keys. Choose the type of reCaptcha : We need to choose the option reCAPTCHA V2. Domains: We can insert any domains (on per line ) to limit the API uses. After that, we need to accept the Terms of Service ( “Accept the reCAPTCHA Terms of Service” ). Site Key: Key generated by google after reCAPTCHA project creation. Secret Key: Key generated by google after reCAPTCHA project creation. 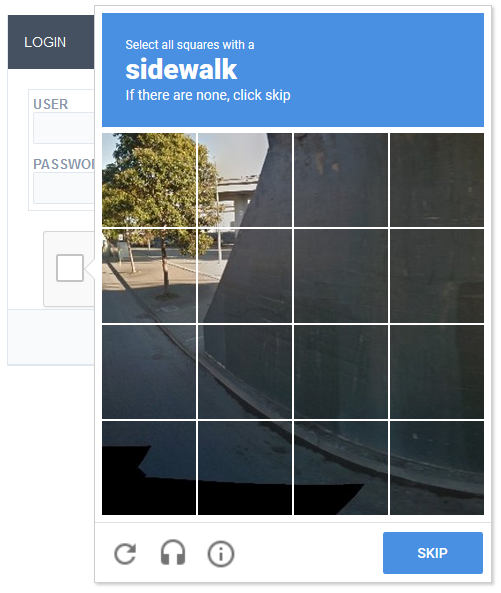 Left: Position the reCAPTCHA component at left. Center: Position the reCAPTCHA component at center. 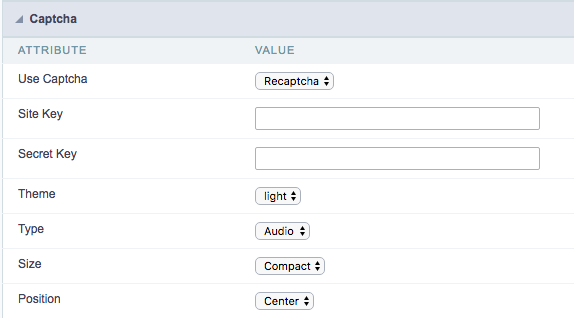 Rigth : Position the reCAPTCHA component at right.